Elo Ozumba fights for the ball. The senior forward and the Wildcats allowed three goals in the first 21 minutes and eventually lost 3-1 to Wisconsin. Twenty minutes into Northwestern’s visit to Wisconsin on Wednesday, three goals by the hosts had already all but sealed the game’s result. 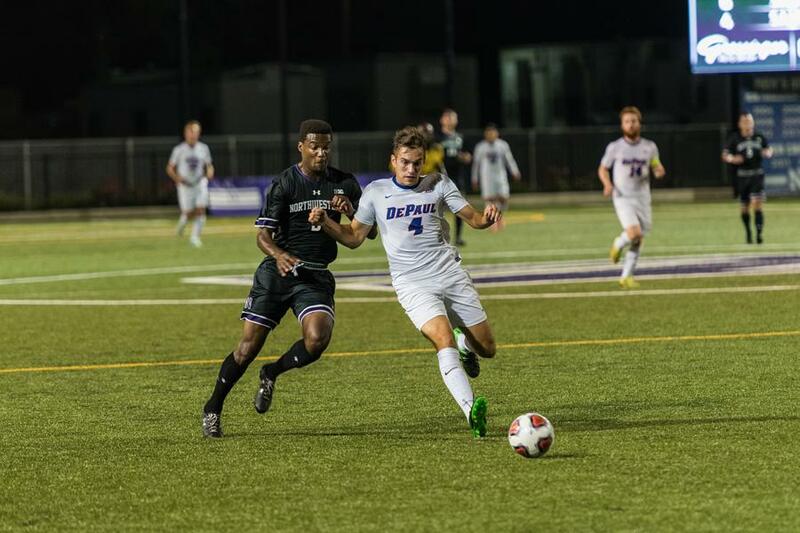 The Wildcats (1-5, 0-2 Big Ten) played the Badgers (2-1-2, 1-1) even or better from then on, and junior defender Emmett Gordon tallied his first career goal for NU, but the early deficit proved insurmountable in a 3-1 loss. The Badgers opened the scoring in the third minute after a flurry of chances, finally finished off with a wide-open look from just beyond the penalty spot. The lead was doubled four minutes later when senior forward Tom Barlow evaded several Cats defenders and looped a shot into the corner of the net from the top of the box, exciting a crowd of 1,464 in Madison. And in the 21st minute, a cross in front of goal deflected off a backtracking NU defender and into the goal, leaving freshman goalkeeper Miha Miskovic helpless for the third time. The Cats scored their lone goal in the 41st minute, with junior midfielder Camden Buescher’s corner headed off the crossbar by freshman defender Garrett Opperman before eventually bouncing around to Gordon, who buried a one-time volley past an array of Badgers defenders. Gordon said the goal was a result of a tactical shift after falling into the 3-0 deficit. NU outshot Wisconsin 5-4 in the second half and 12-11 for the game, but was unable to get another ball past Badgers goalkeeper Philipp Schilling. Seeking to snap a five-game losing streak, the Cats’ focus will now shift to Sunday, when NU will host No. 1 Indiana (4-0-2, 0-0-2) in Evanston. NU took the Hoosiers to overtime in both meetings last season, tying in the regular season and losing in the Big Ten Tournament, largely thanks to some heroics from goalkeepers Robbie White and Francisco Tomasino. With Miskovic, a highly touted product of the Chicago Fire academy system, having now assumed the starting role over White and Tomasino, the Serbian netminder said his transition to the college game will be tested by Indiana.